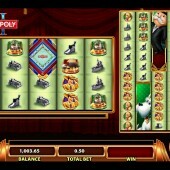 Not a company to rest on its laurels, William Interactive (WMS Gaming) has been busy rolling out more Monopoly themed slots following the take over of the licensing deal in 2015 from IGT. Following the recent launch of the slightly dubious Once Around Deluxe title, WMS have followed it up with the latest in the series - Epic Monopoly II. This time Williams Interactive appear to have wanted to avoid any mentions of flops or disasters and have opted for the Colossal Reels reel engine, which has proved a huge success for slots like the Gladiator-themed Spartacus slot or the equally popular rock band slot KISS. So has 100 paylines, 9 reels and 80 symbols on the screen at any one time paid off? Do Colossal Reels and Monopoly go together? When I think Colossal Reels then words enter my brain like epicness, awesomeous and fan-dabby-dozy (ok, most of those aren’t really words, but I hope you get my point). I can’t really say that Mr Money Bags and the dice game of Monopoly conjure the same sort of thoughts. Therefore from the offset I am not really getting a matching pair. If you are unfamiliar with Colossal Reels then it is quite simple, you get two sets of reels – the first set has 5 reels and the second has 4 reels. The first set of reels has only 4 symbol positions, but the second has a whopping 12. Combine this with stacked symbols and the ability of stacked wilds to be copied across to the second set of reels if they appear on the first set and you have got an exciting game format. However, I can’t get away from the fact that Williams Interactive are trying to combine Monopoly with Colossal Reels, it’s like combining ice cream with bacon, they just don’t go! Epic Free Spins bonus – Earn between 7 – 20 free spins, with the opportunity of re-triggering if you land 3 more bonus symbols during the feature. Extra stacked wilds are included in the free spins bonus. Epic Wheel bonus – Land 3 or more bonus scatters and you will trigger the Bonus Wheel. Spin the Wheel to reveal a prize which could be a chance card, a cash reward or another spin. Around the Board bonus – This feature takes you on a trip round the famous Monopoly board. Roll the dice and where Mr Money Bags lands will reveal prizes along the way. The feature ends when you have no more rolls of the dice left. 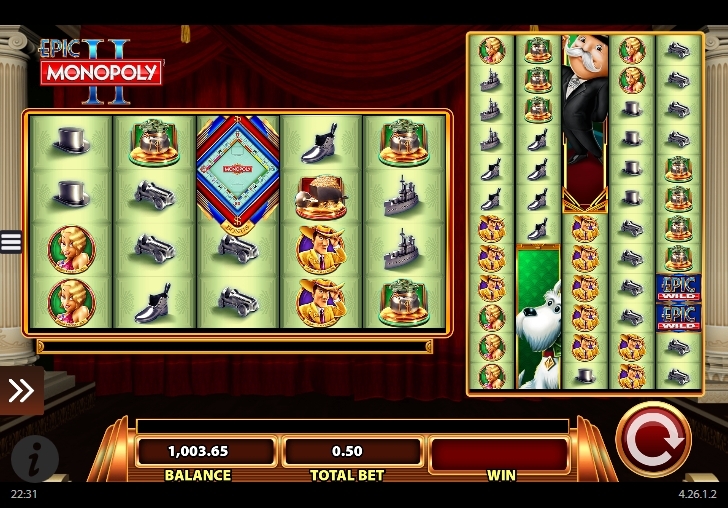 It’s a tough gig making a Monopoly themed slot game and I can appreciate it is no easy task for Williams Interactive, who are now part of larger business SG Interactive. I don’t personally think it was a good idea for them to use the Colossal Reels template for this type of game, which I pointed out earlier. It does no favours to games like the very addictive Giants Gold or the fairytale-inspired Li’l Red Riches, which do fit the Colossal Reels mold really well. Epic Monopoly II is however an improvement on other recent Monopoly slots and certainly an improvement on what we have previously seen from Williams Interactive with regards to this franchise.